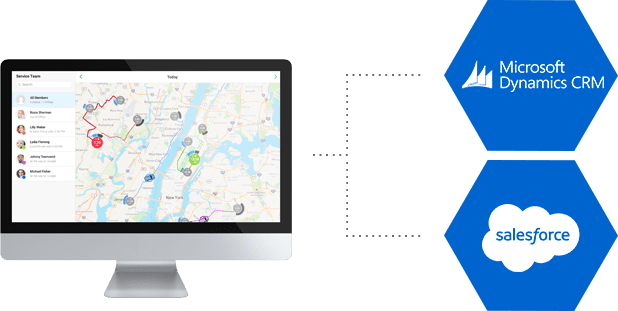 Plan routes and keep track of your employees‘ work progress with Route Planner by Resco – combining geographic and calendar data, even taking into account variables such as traffic and weather. Fully interactive, Route Planner gives you a clear overview of your staff and the tasks at hand. Utilizing the map and calendar view with real-time data, you’ll always know who can drop in for a customer visit or answer a last minute service request. The map view shows you the areas each person on your staff is responsible for, highlighted with matching colors. Once you’ve created the route plan, the solid line indicates the route they have already completed, and the dotted line represents the part still ahead. In Route Planner you also have the information on traffic control, road closures, and even accidents. So you always know when your staff needs to take a detour because of a traffic jam which threatens the successful completion of the next job, on time. And don’t forget to check the weather. After all, what’s the point of dispatching your crew to a client, if there’s a storm coming? They might not even get there, let alone complete the repairs required. With the built-in Time Scheduler, you can view how the team has progressed throughout the day. And based on past and current data, the Route Planner dynamically updates the schedule of your staff. So you can even view a forecast for the near future developments. Team leaders, managers, or supervisors utilize a web-based app to schedule work, plan routes and monitor progress. Workers in the field use a dedicated mobile app in which they receive & complete work orders, running on all major operating systems and devices. Route Planner can be also natively integrated with Microsoft Dynamics 365/CRM & Salesforce. API for integration with 3rd party systems is also available.